Walur beach is situated in the west coast of Lampung, near to Krui town and it located in the dense forest of Bukit Barisan Selatan National Park. A beach with good pictureque with vast stretches of white sand that directly facing the open Indian Ocean. 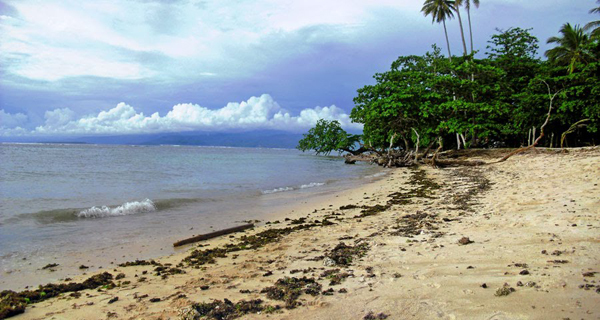 The beach is located at Walur Village, Pesisir Tengah district, Pesisir Barat Regency, Lampung. An interesting fact about Walur Beach is taken from the continuation of the swathes of sand that are the Labuhan Jukung and Way Redak Beaches that highlight the western coast of Lampung. The three beaches are connected to one another through an asphalt road that is off the main road between the towns of Krui and Liwo. The situation in Walur beach is typical to the tropical beach with shady nuance along the row lines of coconut tress that growing on green grassy fields, accompanied by the soft breeze that just like welcoming you to its enchanting ambience. The shore is features soft white sand that perfectly match for allkinds of fun beach activities. The water at this beach is clear and the waves relatively calm, making this a perfect place to swim. The beach is ideal for a family vacation, where all members of the family can have a good time together and away from the bustling day for awhile. As the sun sets in the afternoon, the nature also displays some of its magnificent panorama at Walur Beach. To reach this beach From Bandar Lampung, is about 250 km away or it takes 4-5 hours drive to Krui, capital town of the Pesisir Barat Regency. While from the town of Krui, Walur Beach is only about 5 km ahead. Aside from the beautiful scenery, the waters of Walur Beach are also teeming with many kinds of fish that draw anglers. There is also a lighthouse where you can observe the beauty of the beach and its surroundings from above. During weekends or public holidays, the beach usually fills with locals and their families carrying picnic baskets, mats, and recreational stuff. However, the beach is vast enough to accommodate everyone, so you do not need to worry about lack of space. For kids, building sandcastles or just splashing around in shallow water of the beach is truly a rewarding experience. While those who simply want to enjoy nature, lieback on the soft sands with the gentle breeze indulging your body, making this simply a gorgeous place to spend the weekend.